How do I get involved in re-enacting? Check out the Calendar of events page and attend a few living history events where there are re-enactors. These may be battle re-enactments, encampments or 'living history' displays. Compare several groups and talk with a few individuals from each of them. Look at the group itself, beyond the period clothing. Are the groups you've seen emphasizing things that interest you? Is their approach to history one that appeals to you? How are they organized? Do they seem open and friendly? If you choose the Royal Scots Grenadiers, you will be invited to attend activities with the group as a guest. Only by participating in a few events can you get the feel of re-enacting. How much does it cost? What are the membership fees? Membership fees are $25 for the first membership in a family and $20 each subsequent member. When first joining up the minimum kit can be purchased quickly and easily. From there other kit items are added over time and there are ways we can help. A basic list of initial kit items and costs will be provided. The total basic kit amount for a man is approximately $200. Do not purchase any equipment before discussing it with unit representatives . Do remember initially you would be able to borrow most of the equipment as many members have spare. Can everyone in my family get involved and what role can I or members of my family portray? Absolutely. Membership in the UCMRS is open to any and all interested persons and every member of your family can get involved with this hobby in one way or another. Many members bring the whole family out and enjoy re-enacting history together. Members can portray a traditional period role of the 1st (Royal Scots) Regiment be it a soldier on or off duty or a camp follower of the line. Children can be inexpensively outfitted as children of the period. Individuals under the age of 18 interested in joining must join with a participating parent. Those under 18 who wish to join the line must be accompanied on the line by a parent. To join the line, members must be at least 16 years of age and sufficient skill level and size appropriate. How much does a musket cost and where do I buy one? This is the single most expensive item that a new member will purchase to become a soldier on the line. Muskets range from $700 to $1100 new and $500 to $800 used. There are many producers and sellers of reproduction muskets. The unit will provide you with listings and options of purchase. Are the redcoats made of real wool and how much do they cost? What else do I need to purchase? The regimental tunic is made of 100% wool and are reproduced as historically accurate as can be determined through exhaustive research. Depending where one gets it made and by whom will determine the cost. A new regimental tunic can range anywhere from $300 to $500. There are several options to have it made. A new member can make their own, have a friend who can sew make it, or we can recommend a number of sources to contact. 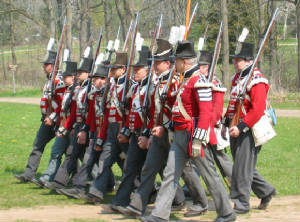 In addition to the basic kit (pants, shirt, gaiters, neck stock, barrack's jacket, forage cap and the tunic/musket) a new recruit should endeavour to acquire as soon as possible a standard British wedge tent of the period. This valuable piece of equipment costs roughly $350-$400 and allows the member to camp out with the unit and battalion. As mentioned previously do not rush out and purchase items right away. Come out and join us to see what it is like and if it is for you. Once you are sure, the unit will provide a list of items which should be purchased and in what order of importance. An elite soldier typically chosen for bravery, steadiness and discipline. A soldier who was initially specially trained and equipped for throwing grenades. By the Revolutionary War period, the Grenadiers had ceased to throw grenades, since the tactic was no longer considered to be militarily effective. Grenadiers were employed as shock troops, they were usually bigger, stronger men and used in siege operations, storming breaches and leading the way through such breakthroughs. Take the King's shilling and join the premier regiment of the British forces in North America, join the Royal Scots today. Send a brief message to ucmrs@royalscotsgrenadiers.com and include your name, e-mail, phone number, city, province/state, role you'd be interested in and how you heard about us. A representative will contact you immediately. Or you can CLICK HERE to fill out a recruiting form.